The Stevens Point Historic Murals Walk comprises nine murals along a 1.1 mile route, beginning at the site of "The Old Post Office" (above) (now the "new" post office), and ending at Cozy Kitchen, Steven Point's longest operating restaurant, where Yelp reviewers rave about the food. Except for the "Painting the Town" mural, all murals are the work of Butternut (Ashland County) muralist Kelly Meredith. Click here to read more about Kelly and her fabulous work. To view the Stevens Point Historic Murals, I suggest beginning at "The Old Post Office" mural, then driving to the Portage County Public Library, where there is plenty of parking, and walking the route from there. The mural locations are inside a maze of one-way streets -- very, very frustrating to access (1) when one is unfamiliar with the area and (2) because parking is quite limited at several of the locations. I drove the route because temps were below freezing the day of my visit (March 27, 2015) and because it was my first time to visit the murals; doable, but ended up driving in a lot of circles. Use this Google Map of the entire route to help you plan your walk. Photos of each mural are posted below, in the order they appear on the route. The murals are beautiful, the history interesting! Enjoy! NOTE: For information about donating to the downtown murals, contact the Community Foundation of Central Wisconsin at 715-342-4454. Stevens Point Historic Mural "McDonald Law Office"
Stevens Point Historic Mural "Painting the Town"
at the Stevens Point Area Visitor Center. on southbound Division Street, at 340 Division Street North. 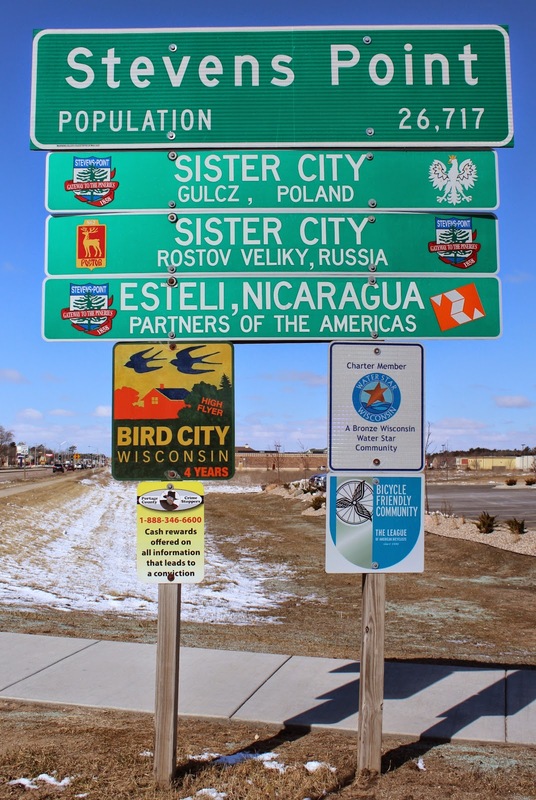 The murals are located in Stevens Point, Wisconsin.